Russia has told visiting head of the Presidency Council (PC) Faiez Serraj and PC deputy Ahmed Maetig that the Libyan crisis has be settled by Libyans but that it can contribute by helping create conditions for peace in the country. “Only the Libyan people can overcome the current crisis,” said Russian foreign minister Sergey Lavrov during talks with Serraj today. Outside attempts to dictate a settlement would inevitably fail, he believed. However, Russia could help. “We are interested in helping it overcome these difficulties. We would like to see Libya as a united and prosperous nation relying on stable government institutions and a viable army,” Lavrov emphasised. That was where Russia could help, Lavrov told Serraj, because Moscow had contacts “with all Libyan parties, without exception”. He added, however, that a Libyan settlement had to be “in accordance with the UN Security Council resolution” – that of December 2015 which approved the Libyan Political Agreement. 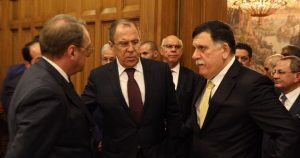 The day saw intensive discussions between the Russian authorities and the visiting Libyan team which included the PC’s foreign minister Mohamed Siala and the deputy leader of the House of Representatives Emhemed Shouaib. Siala and Maetig earlier held separate talks with Russia’s Arabic-speaking deputy foreign minister Mikhail Bogdanov, who is in charge of Middle Eastern and African affairs. The discussions focussed on the Libyan crisis as well as on further developing bilateral relations, including oil and gas and transportation projects. Russian energy companies have a number of concessions in Libya and Russian Railways has the stalled $4.5-billion contact to build the Sirte-Benghazi rail link. It is also claimed that Libya owes Russia over $4 billion dollars for military equipment. Serraj also drew attention to reactivating these and other bilateral agreements in his talks with Lavrov. There was no meeting with President Vladimir Putin who is in Siberia.